GameStop has the Go Retro Portable on sale for just $26.24, down from $34.99. Game on the go with the Go Retro! Portable. Enjoy up to 10 hours of nonstop gameplay anywhere and anytime. 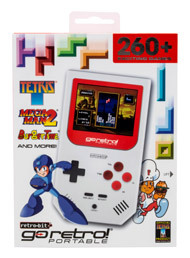 Packed with over 250 games featuring Tetris, Mega Man 2, Mega Man 3, BurgerTime, Strider, 1942, Bad Dudes and More!